Cecilia Fox | Weekly Record Herald Tipp City Schools Superintendent Gretta Kumpf answered questions about the Broadway Elementary School property. 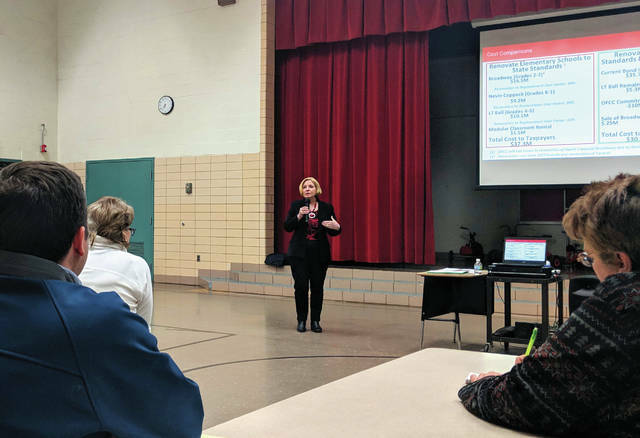 TIPP CITY — At a meeting to discuss the future of the Broadway Elementary School site, Superintendent Gretta Kumpf answered some of the questions raised after the last meeting. If the district’s $35.75 million bond issue is approved in May, the money will be used to renovate L.T. Ball Intermediate School and add space to that building to house pre-kindergarten through fifth grade. Broadway Elementary and Nevin Coppock Elementary would no longer be used. If a bond issue is passed in May, it could take about two and a half years to build the new facilities. At the previous meeting, attendees asked what the difference in cost would be between renovation existing facilities and building new. The cost to renovate both Broadway and Nevin Coppock, including the expense of renting modular classrooms during renovation, would be $37.3 million, Kumpf said. The cost of the proposed project to the taxpayers, minus the $10 million commitment from the state, would be $30.8 million. Gary Pfister, the district’s director of services, noted that the Ohio Facilities Construction Commission will not invest in the renovation of Broadway and Nevin Coppock. Kumpf also answered the question of the property’s worth. The value of the land without the structures would be about $264,900; with structures, it would be about $3,770,500. Asked if there were any interested buyers, Kumpf said no. At a previous meeting, Kumpf outlined the district’s responsibilities regarding the 6 acre lot. The district is legally required to offer the land to any community or STEM schools that exist in the district’s territory. There currently are none, so the district must put the property up for public auction. The district has to give 30 days public notice of the auction and can accept or reject a bid. If a bid is rejected, the district can pursue a private sale or hold another auction. The property is currently zoned for two-family residential use, which means it can be used for single family dwellings, passive parks and open space, and agriculture. With approval from the Planning Board, it could also be used for residential service homes, two-family dwellings, community centers, bed and breakfasts, active parks and playgrounds, places of worship, government facilities, cemeteries, and nursery schools or daycare. At the last meeting, attendees suggested uses for the site including playgrounds and athletic fields, the preservation of the gym, and pavilion or park. The group agreed that they were not in favor rental properties or subsidized housing, and leaving the building or property vacant, or new housing that wouldn’t match the neighborhood. More meetings are set for 6:30-7:30 p.m. on March 5 and April 2.
https://www.weeklyrecordherald.com/wp-content/uploads/sites/51/2019/02/web1_broadway.jpgCecilia Fox | Weekly Record Herald Tipp City Schools Superintendent Gretta Kumpf answered questions about the Broadway Elementary School property.